Got a license for those seeds? Seed swap at the ‘Harvesting Change: Food and Community’ gathering in Detroit, Michigan, May 20, 2014. Benton County Nursery Co. seed catalogue, 1960. A librarian from the Tulsa City and County Community Library in Oklahoma explains their seed program. Botswana’s elephants are officially an economic asset. The way traditional economics measures the environment, or in many instances doesn’t, is a long standing problem. For decades, our primary measure of economic activity, gross domestic product (GDP) has measured “progress” without accounting for the cost borne by the environment, nor the substantial benefits we receive from it. In politics and economics we regularly use the word “capital” to mean assets like buildings or cash. This should extend to the environment too. Nature is an asset. The need to recognise our natural capital is highlighted by its ongoing loss – the reductions in forests, the depletion of fish stocks, the degradation of soil, the loss of biodiversity, more severe flooding and similar trends. The human and environmental cost of these losses are invisible if you only look at GDP, and so there is little political incentive to do anything. We must change this, and make nature integral in our calculations and decision making. Our economic system functions within, not alongside, an environmental reality. The tools have been created over the past twenty years to factor the environment into our decision making. We just need to take the next step. For over 20 years experts around the world have been developing extended economic accounts to include nature. They build upon the United Nations (UN) economic accounting framework called the System of National Accounts (SNA). In 2012, the UN Statistical Commission adopted the System of Environmental-Economic Accounting (SEEA) as the international statistical standard for the integration of environmental data within the SNA, including new standards for the measurement of GDP adjusted for the depletion of natural resources such as timber, fish, water and mineral resources. Progress in the implementation of the standard is ramping up, with at least 70 countries having or planning SEEA based measurement programs. Legislation has been passed for EU countries that must now produce accounts annually in six areas of the SEEA. The World Bank is leading a global partnership, WAVES, to drive forward accounting for natural capital in developing countries. It uses the SEEA as the technical basis for its work. Australia has been at the leading edge of these developments and the Australian Bureau of Statistics (ABS) has a small but well established program for environmental accounting. There are accounts for flows of water and energy on an annual basis, and annual measures of the stocks and values of land and various natural resources. These, and other environmental-economic accounts, are all brought together in the annual report, Australian Environmental-Economic Accounts. At a corporate level, there is also interest in extended accounting. A substantive step forward was the release of the Natural Capital Protocol in July 2016 by the Natural Capital Coalition involving contributions from a wide range of stakeholders. The corporate focus has mostly been on accounting for carbon emissions and water use, but extensions into other areas are well underway. But these advances have not been enough. Getting traction and buy-in with decision makers remains challenging and the level of investment needed to ensure more frequent reporting has not been forthcoming. Although accounting for environmental stocks and flows is useful and should be encouraged, none of the accounts on their own drive home the link between economic activity and the environment. Without a broader, more systemic framing, it remains easy to see the environment as a set of separable components, which are external to the economy. This siloed view is reinforced in our approaches to environmental measurement. Experts in soil, water, biodiversity and the climate all establish their particular approaches, without consideration for how their data can be used and applied in an integrated way. To create this more holistic view, SEEA has recently been extended to account for ecosystems and biodiversity. The resulting accounting framework melds human production and consumption with the benefits provided by environmental ecosystems. These include the provision of timber, fish and water, the filtration of air and water, carbon sequestration and cultural and amenity services. Sustaining this requires maintaining our natural capital. Ecosystem accounting thus gives a platform for a full integration of nature with standard economic data on production, income and wealth. This advance has allowed for more engagement with experts in other fields – economics, statistics, ecological and biophysical sciences, geography and accounting. Together, the experts involved have worked to create a common understanding and language for the considerable depth of knowledge that exists in each “silo”. Ecosystem accounting projects can now been found all over the world at national and local scales. They are taking place in many developed countries but examples are also present in less statistically advanced countries such as the Philippines, Peru, Uganda and Mexico. In Australia, the ABS is developing ecosystem accounts for the Great Barrier Reef and the SEEA EEA framework has been applied extensively in Victoria in various contexts, for example to support the recent State of the Bays report and in the assessment of Victoria’s national parks. Indeed, in Victoria, environmental-economic accounting is a key feature in its recently released strategic plans for biodiversity and the provision of clean air and water. Building on all of these developments, in November 2016 , Australia’s environment ministers “agreed to work together to develop a common national approach to environmental accounts”. However, while the recent advances in environmental-economic accounting have opened new possibilities, much work still remains. Measuring and accounting for our natural capital is only part of the story. We must integrate the information into the analytical tools and models that decision makers use. We must report natural capital measures in budget statements and annual reports. And, most importantly, we must use the information to build the conversation about the inherent connection between natural capital and economic activity. The standard set of financial and economic data in the national accounts and corporate reports cannot be regarded as best practice any longer. Australia is a mature and wealthy society, the next step must be investment by governments and corporations in systems to account for natural capital and hence give themselves a complete set of information for economic decision making. A sustainable Australia is possible – but we have to choose it. That’s the finding of a paper published today in Nature. The paper is the result of a larger project to deliver the first Australian National Outlook report, more than two years in the making, which CSIRO is also releasing today. As part of this analysis we looked at whether achieving sustainability will require a shift in our values, such as rejecting consumerism. We also looked at the contributions of choices made by individuals (such as consuming less water or energy) and of choices made collectively by society (such as policies to reduce greenhouse gas emissions). We found that collective policy choices are crucial, and that Australia could make great progress to sustainability without any changes in social values. Few topics generate more heat, and less light, than debates over economic growth and sustainability. At one end of the spectrum, “technological optimists” suggest that the marvellous invisible hand will take care of everything, with market-driven improvements in technology automatically protecting essential natural resources while also improving living standards. Unfortunately, there is no real evidence to back this, particularly in protecting unpriced natural resources such as ocean fisheries, or the services provided by a stable climate. Instead the evidence suggests we are already crossing important planetary boundaries. Other the other end of the spectrum, people argue that achieving sustainability will require a rejection of economic growth, or a shift in values away from consumerism and towards a more ecologically attuned lifestyles. We refer to this group as advocating “communitarian limits”. A third “institutional reform” approach argues that policy reform can reconcile economic and ecological goals – and is attacked from one side as anti-business alarmism, and from the other as indulging in pro-growth greenwash. My colleagues and I have spent much of the past two years developing a new framework to explore how Australia can decouple economic growth from multiple environmental pressures – including greenhouse emissions, water stress, and the loss of native habitat. 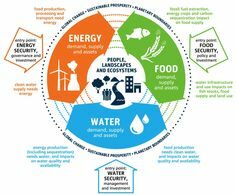 We use nine linked models to assess interactions between energy, water and food (and links to ecosystem services) in the context of climate change. The National Outlook focuses on the intersection of water, energy and food. 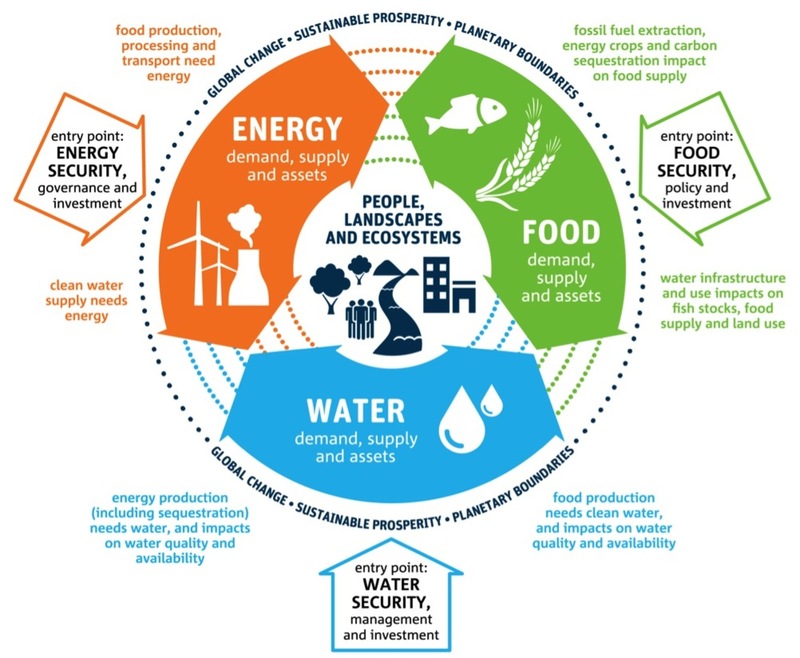 The project provides projections for more than 20 scenarios, exploring different potential trends for consumption and working hours; energy and resource efficiency; agricultural productivity; new land-sector markets for energy feedstocks and ecosystem services; national and global abatement efforts, climate, and global economic growth. While our major focus is on Australia, at the national scale, we also model what might happen globally, and at more detailed state and local scales within Australia. We find economic growth and environmental impacts can be decoupled − in the right circumstances. National income per person increases by 12-15% per decade from now to 2050, while the value of economic activity almost triples. In stark contrast to income, which rises across all scenarios, environmental performance varies widely. 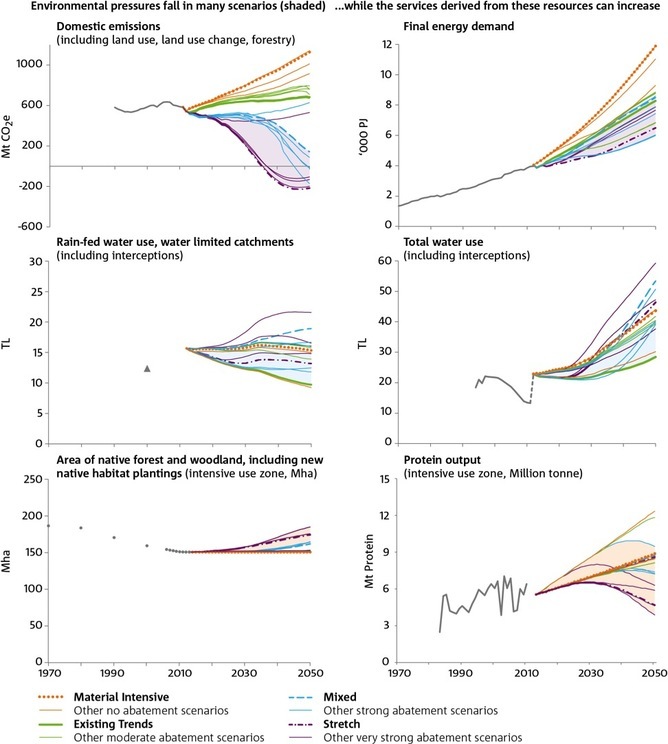 Key environmental indicators such as greenhouse gas emissions, water stress, and native habitat and biodiversity are projected to more than double, stabilise, or fall across different scenarios to 2050. As shown in the chart below, we find that energy rises in all scenarios, but that greenhouse emissions can fall at the same time – with the right choices and technologies. Water use can also rise without increasing extractions from already stressed catchments. Food output (here indicated by protein) can increase, while native habitat is restored. Many of the 20 scenarios explored would represent substantial progress towards sustainable prosperity. Indeed, we find that Australia could begin to repair past damage: restoring significant areas of native habitat and achieving negative emissions (net sequestration) of greenhouse gasses. We use the normal definition of economic growth as measured by increase in Gross Domestic Product (GDP) – the value of goods and services produced in an economy – consistent with the national accounts framework. Some authors use a different definition, most notably Herman Daly a leading advocate for a steady state economy. Daly defines growth as an increase in physical economic scale, such as resource extraction, and goes on to argue that indefinite (material) economic growth is not possible. While this may be true, for his definition, it can be confusing for people that do not realise he is not referring to GDP growth. Indeed, Daly recently acknowledged that economic (GDP) growth is possible with finite resources and steady material throughput. These definitions matter: we project growth (GDP – measured in real dollars, adjusted for inflation) increases by more than 160% in scenarios where domestic material extractions and throughput (measured in tonnes) decreases by around 40%. But here is the real crunch: we find these substantial steps toward sustainability could build on policy approaches that are already in place in Australia or other countries. This implies Australia could make enormous progress towards a more sustainable future without a major change in what we value. We can be confident that a values shift is not required to achieve these outcomes – at least before 2050 – because none of the scenarios we modelled assume change in values or a new social or environmental ethic. Instead, we show that people will make choices to change their behaviour to make the best of particular policy settings. These choices shape production and consumption. For instance, we consider increasing Australia’s climate effort in line with other countries would be consistent with Australian public opinion and assessments of Australia’s national interest in limiting the rise in average global temperature to 2°C. So we do not interpret this as implying a change in values. But we find collective choices are crucial. For example, individual choices about whether to drive or catch a train to work are strongly shaped by prior collective choices about transport infrastructure. Collective choices are often, but not always implemented through changes in government policy, legislation, and programs. We find collective choices explain around 50-90% of differences in environmental performance and resource use across the scenarios we model. Consistent with the institutional reform approach, we find top-down collective choices are particularly important in shaping “public good” outcomes – accounting for at least 83% of the difference between scenarios for greenhouse gas emissions. Bottom-up individual choices play a greater role when private and public benefits are aligned. For instance individual choices account for up to half of the difference between scenarios for energy use (33–47%) and non-agricultural water consumption (16–53%). While individual choices are important, we find decisions we make as a society are likely to shape Australia’s future sustainability more than the decisions we make as businesses and households. Sustainable prosperity is possible, but not predestined. Australia is free to choose. Steve will be on hand for an Author Q&A between 9:30 and 10:30am AEDT on Friday, November 6, 2015. Post your questions in the comments section below.